Welcome to the StencilGirl Blog Hop featuring StencilGirl Artist Pam Carriker! If you have arrived from Leslie's Blog you are on the right track. If not, you can follow the list below and start from the beginning. I am a huge fan of Pam Carriker's artwork! 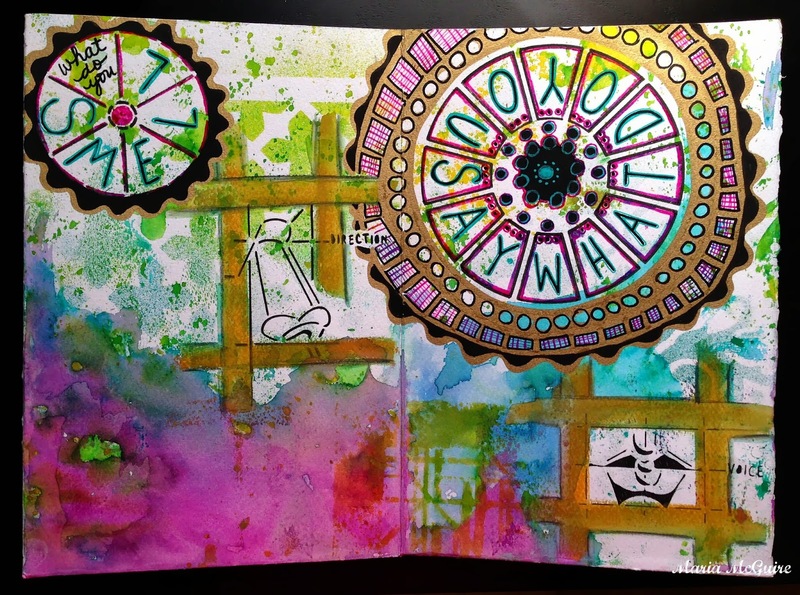 Her deep rich colors and attention to detail make me sit and look at her Art Journal pages in amazement! I am also lucky enough to know Pam in person and work with her through StencilGirl which makes it even better. You can see all of Pam's StencilGirl stencils HERE. Before you leave, make sure you leave a comment to be entered into the GIVEAWAY on StencilGirl Talk. ALL comments in the entire Blog Hop are eligible! You will have until Monday, September 30th @ 11:59PM Central Time to leave a comment. I can't believe how many different ways everyone used the stencils! It is amazing!! Last but not least! Beautiful! Love your use of Pam's stencils! This has been an amazing blog hop! Thank you!! fantastic pages Maria!! I especially love the "peace, where should I go" one. These stencil designs are wonderful! You have added so much more goodness to this since the workshop- and I love it even more than I did at Art Is You! Love love love this! so inspired by your pages!! now i really want these stencils!! i like the way you use all the letters fun! Beautiful pages Maria. It would be amazing to take a workshop with Pam! I'm so envious! Love your pages - so fun to see how different each blogger uses these stencils! These color wheel stencils are great - you used them in such a fun way! Thanks for hosting a giveaway. VERY cool use of the stencils! Maria- gorgeous gorgeous gorgeous!!! love your pages!! Wonderful pages and use of the stencil! I love seeing all the different takes with this stencil! Such creative ideas. Thanks for being in the hop! OMG, I love your journal pages - so colorful and interesting. 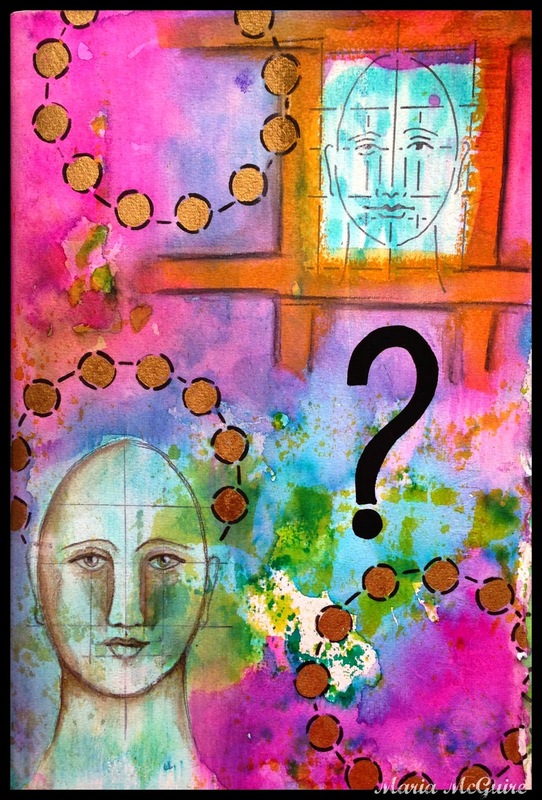 I have a couple of Pam's other stencils (the faces), so I'd love to create journal pages like yours. I'm so happy to have found you through the blog hop, I love your work, so I'm subscribing to your blog:) Thanks for sharing your wonderful art. Your journals are lovely and the stencils jump out with glee. What wonderful pages you have! I can see how these stencils sure come in handy! Great creativity again this hop! It's interesting to know that you never consider you work complete. The pages are awesome and the stencils have worked so well. 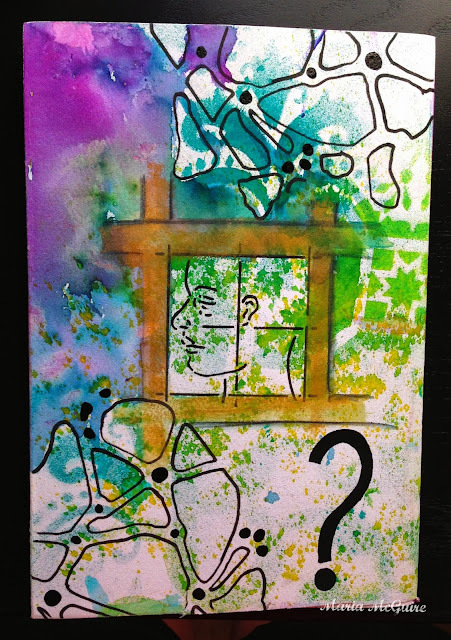 I too am a Pam Carriker fan, and have a journal that is not yet done, so it was fun to see your post today! You've done some really nice pages - hopefully you'll share as you work to complete them? I love your use of color! What cool pages. I like them all. 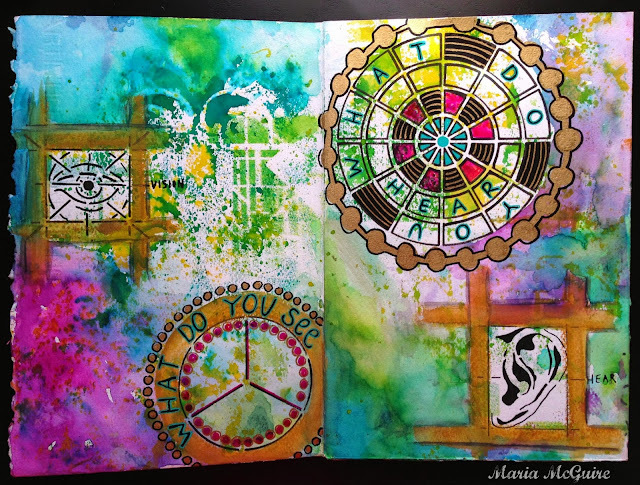 Gorgeous colours and lovely journal, great use of the stencils again, what a great blog hop. Thanks for sharing, Maria - gorgeous pages! Wonderful. Each one was so unique! Thank you for sharing. This is stunning. Love Pam's stencil and am amazed by all of the different things y'all all came up with! Thanks for the giveaway and for sharing!! Love all the different ways this stencil has been used! Hope I win the giveaway! You found really creative ways to use that stencil! I love how you may not know that it is the same stencil in all the pieces. Maria, love what you accomplished with Pam's stencils! I think your colors are rich and invite you to look further into your work, thank you -once again for inspiring all of us! Looks like you had a lot of fun, so creative! Oooh . . . so much color and creativity! Would love to try one of the stencils . . . looks like so much fun. oh, what a beautiful colors in this page, is fantastic!!! Love the colors and design. Fun pages. Thanks for inspiring me. Why do I love circles so much??? This is an awesome stencil set. I want it! Wow! Great creativity! Would love to win any of these. I love your pages. They're beautiful. Very inspiring. Thanks for sharing, Johanne L.
I feally like the senses as the theme of your journal work with Pams new stencil. Great journal! Thanks for the chance to win! Fantastic pieces! You made the most of Pam's stencils! Love the variety in the use of the stencil. Very creative! Love the bright colors of your journal entry. But love the softness, as well. So very gorgeous! Love seeing this stencil in use! Your pages are so unique. I love your use of the stencils and the colors you used. Thanks for sharing. Linda E.
LOVE how you used the spaces in the stencil to write letters and words. Great idea. Wow! 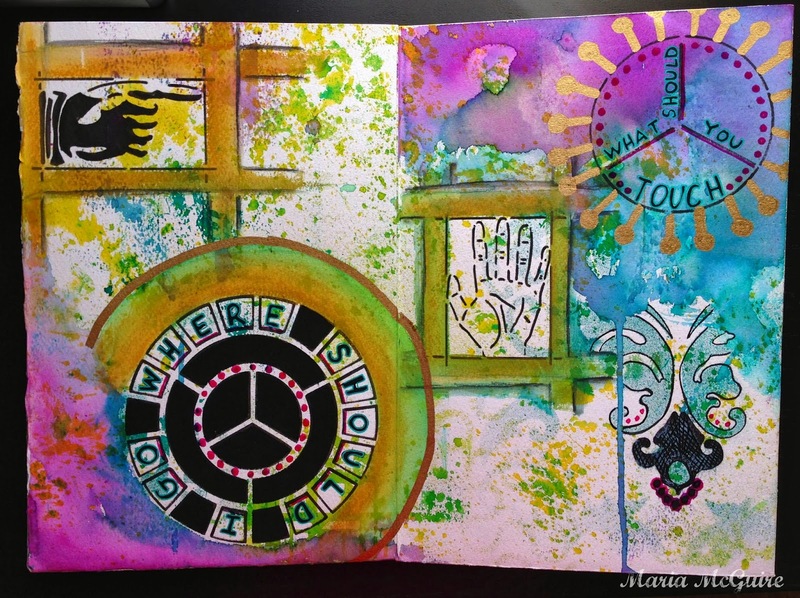 Love the idea of using the stencils as placement for your journaling. Super project! I love the lettering and words in the stencil imafes. Very comp,elling. Such great art! I don't know how I did it but somehow I missed your blog as I hopped along on Friday. But am I ever glad I discovered my misstep. I LOVE how you've used Pam's stencils. So many things pulled me in - the vibrant colours, the use of the grid, the amazingly creative way you've extended the stencils beyond the original design. Great job! !